With 20 years of experience as the world's leading STEM educator, we are experts at setting our students up for long-term success. iD Tech alumni often go on to get in to their dream colleges, launch startups and indie game studios, found nonprofits, and land jobs at iconic companies like Facebook and Google. View success stories. So how do they get there? And what are we doing to help them along their pathways? Our "secret sauce" contains many ingredients, from our inspiring university locations and cutting-edge courses (you can't learn this stuff in school! ), to our world-class instructors and industry-standard tech tools. Most recently, we've introduced a variety of college prep add-ons into the mix, specially designed to help our teens strengthen their portfolios, build their online presence, and get an edge for college applications. 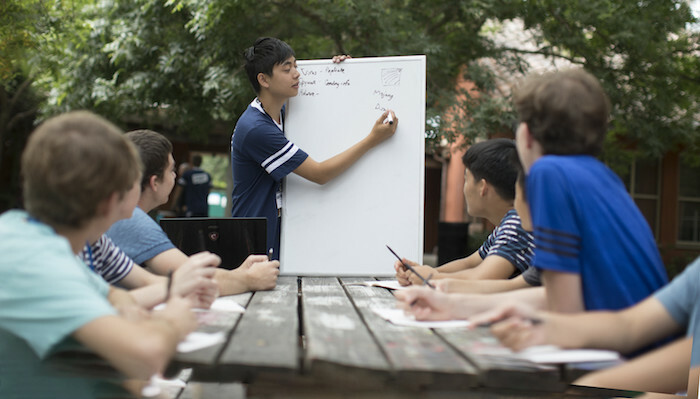 These add-ons are available for students ages 13+ attending weeklong camps at iD Tech Camps (our flagship program), Alexa Café (our all-girls option), our teen-only Academies, and AcademyNEXT (our advanced bootcamp held at Stanford). In our 60 minute, one-on-one advising session, your teen will discover insights, tips, and tools that give them an edge for college. Our remote iD Tech instructors can provide high school course recommendations, demystify the college application process, and share info about top universities and career paths. Continuing Education Units (CEUs) are available at all iD Tech locations. Issued by Villanova University, these nationally recognized units of measurement certify completion of courses with college-level difficulty, assist with pre-college advanced placement, and help students reach their educational goals. *Students attending iD Game Design & Development Academy at Villanova University must be entering 11th or 12th grade to be eligible for CEUs. Please note: CEUs are not transferrable as college credit. Academy students will be provided with access to iFolio, the leading online college portfolio resource. Get organized for college application season and build an impressive online presence! To take advantage of our college prep add-ons, the first step is to register for one of our summer programs. College prep add-ons can be added during checkout or after you’ve registered, via your My Account. Not yet ready? Read iD Tech reviews or contact us with questions.